Director Susanne Bier and screenwriter Anders Thomas Jensen take a break from piercing ethical drama (Open Hearts, Brothers, After the Wedding, In a Better World) to try their hand at romantic comedy, and the result is their first flat-out dud. 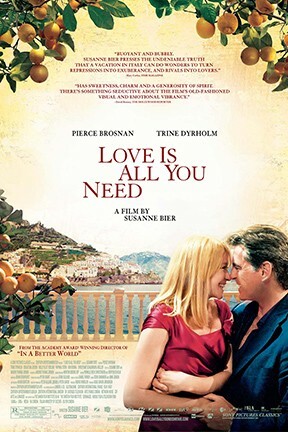 A bald hairdresser who's just survived a cancer scare (Trine Dyrholm) discovers that her husband is cheating on her and settles into a long and predictable path to romance with the angrily widowed Englishman (Pierce Brosnan) whose son is marrying her daughter. I lost count of how many times "That's Amore" turned up on the soundtrack, and the comic situations are so stale (the Brit and the hairdresser meet through a fender bender; the husband shows up at the wedding with his new girlfriend) that the whole thing plays like a Scandinavian Tyler Perry movie. In English and subtitled Danish. Love Is All You Need is not showing in any theaters in the area.